Bollywood Actresses are known for their gorgeous looks, their fashion sense and the way they carry themselves at every event. Be it an award function, a high-profile party or even marriages they don’t fail to impress the paparazzi and the public with their sophisticated yet glamorous look. If you are a die hard fan of a diva and want to look like her on your wedding day then check out these stunning bridal looks of these famous Bollywood actresses. 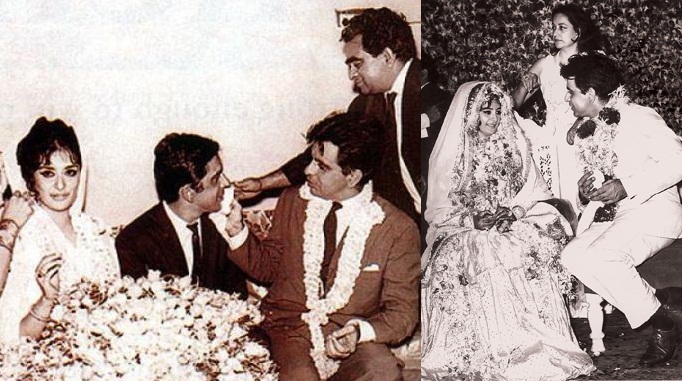 Dilip Kumar and Saira Banu has been the evergreen couple of the Bollywood industry and have stood by each other through the roughest times. 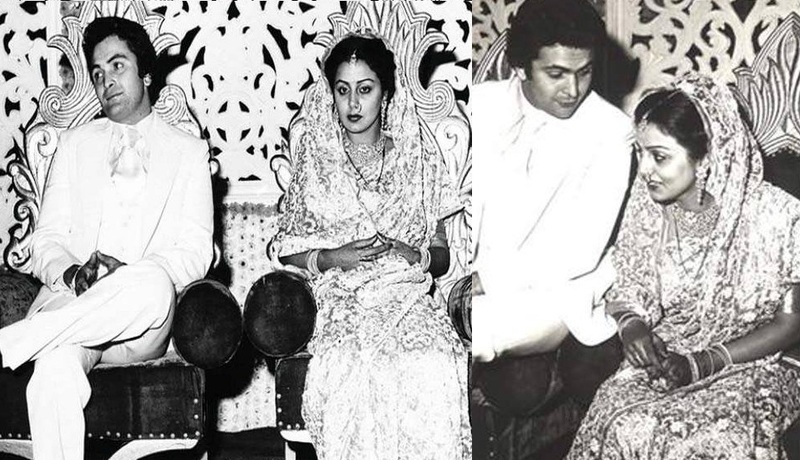 During her Big day, the retro queen Saira Banu wore an elaborate ghagra-choli teamed up with a simple dupatta. 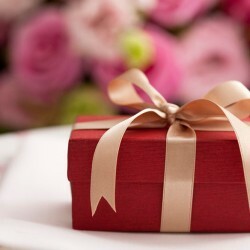 The couple’s happiness can be seen in the pictures in which they are looking at each other with twinkling eyes. 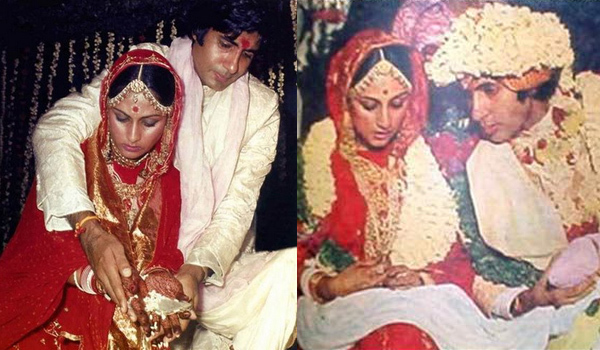 Jaya Bhaduri now Bachchan draped herself in a red saree on her wedding day. She mixed matched her gold jewellery with the golden zari border in her saree and looked absolutely ravishing. The bubbly actress, Neetu Singh, and her significant other Rishi Kapoor made a charming couple in the old days. 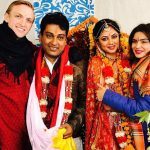 They got hitched together and have worked in many films. 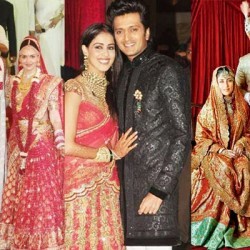 Neetu Singh’s wedding ensemble was a traditional lehenga in which she rocked like never before. ‘The Dream Girl’ Hema Malini went for a rather less is more look in which she wore a simple saree with fewer jewellery pieces. 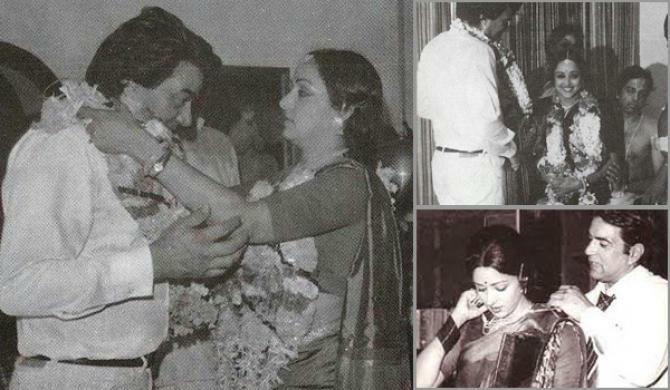 Dharmendra and Hema got married in a typical South Indian ceremony which was a low-key affair. 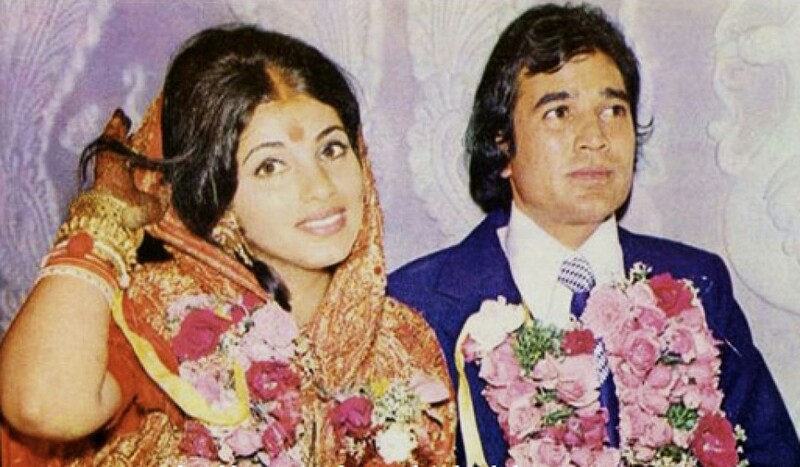 Rising to fame with the super-hit film ‘Bobby’, Dimple Kapadia and late superstar Rajesh Khanna’s love story is quite unforgettable. 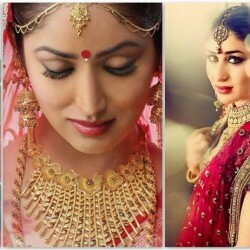 Choosing the most sought over bridal look of that time, Dimple embraced a simple saree with heavy wedding jewellery. Stealing everybody’s heart with her award-winning performance, Dhak-Dhak girl Madhuri Dixit broke millions of hearts when she got married to Dr. Sriram Nene. 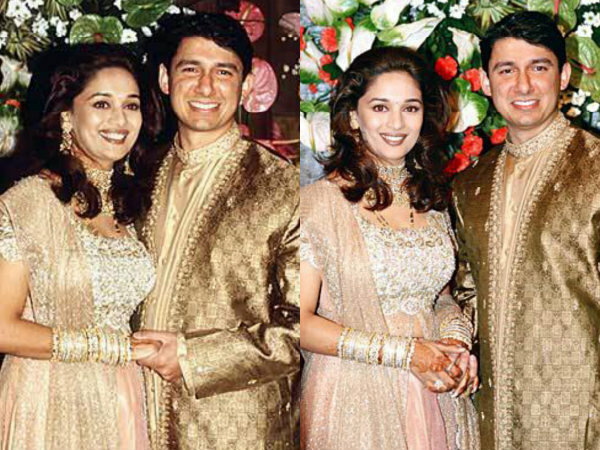 Madhuri went for a modern ethnic look which had intricate work done on it. The dusky beauty, Kajol got tied in the knot in a typical Maharashtrian ceremony. She looked coy and traditional in a green saree. To add five stars to her look, she went ahead by choosing the right traditional jewellery including the Maharashtrian bridal nath, green chooda, and vaaki (armlet). The cherubic and jolly, Sri Devi and Boney Kapoor’s marriage became the headlines of many tabloids and Bollywood gossip magazines but this didn’t stop them from blossoming their love. The actress took the avatar of a traditional South Indian bride and wore a bright colour saree with minimal jewellery. 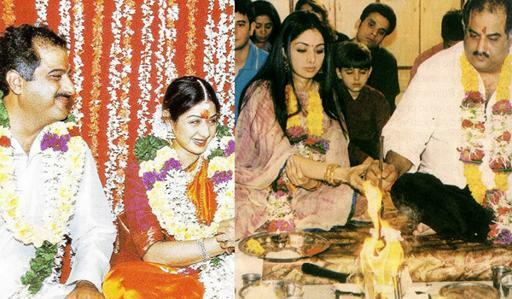 Mrs. Funnybones, Twinkle Khanna got married to the handsome hunk Akshay Kumar in 2001. For her Big Day, the actress chose her favourite colours red and gold that were incorporated in her bridal lehenga and decked simple jewellery with a statement maang tikaa. While a lot of speculation was whether or not their marriage will last but the duo is still happily married together. Making waves with her great acting and dancing skills, Raveena Tandon tied the knot with producer, Anil Thadani in 2004. 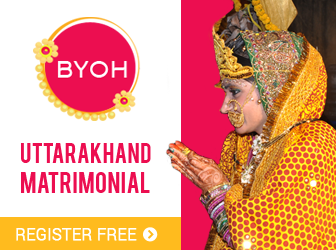 On her wedding, she wore a full sleeve lehenga choli with matching dupatta and Punjabi chooda.